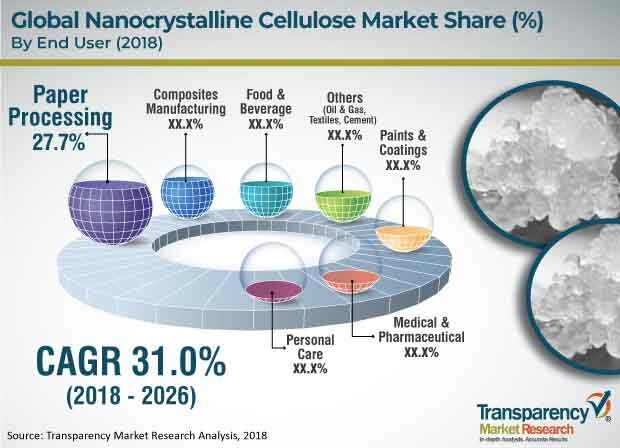 The global nanocrystalline cellulose market was valued around US$ 22.06 Mn in 2017 is anticipated to expand at a CAGR of 31.0% from 2018 to 2026, according to a new report published by Transparency Market Research (TMR) titled “Nanocrystalline Cellulose Market – Global Industry Analysis, Size, Share, Growth, Trends, and Forecast, 2018–2026”. Extensive support and funding from governments and rise in demand for nanocrystalline cellulose from various end-user industries such as composite manufacturing, paper processing, packaging, and medical are projected to drive the global nanocrystalline cellulose market. North America accounts for a considerable share of the global nanocrystalline cellulose market due to the increase in investments in nanocellulose projects, favorable government regulations, and development in composites and paper processing industries. Highly attractive mechanical, optical, chemical, and rheological properties of nanocrystalline cellulose have increase its adoption in various end-user industries ranging from paper processing to oil drilling. Rise in demand for nanocrystalline cellulose is attributed to extensive support and funding from governments, especially in developed such as North America and Europe. Increase in the number of research programs by various universities and government­- supported organizations is attributed to the rise in demand for nanocrystalline cellulose. Increase in demand for reinforcing agents in paper processing, composites manufacturing, and paint & coatings industries is boosting the demand for nanocrystalline cellulose. Nanocrystalline cellulose is a preferred material in drilling fluids which are used in the oil & gas industry. The ability of nanocrystalline cellulose to modify viscosity of drilling fluids helps save time and energy, which is required in oil & gas applications. Demand for nanocrystalline cellulose is increasing in the biomedical sector. Tissue engineering, implantation, wound healing, and antimicrobial therapy are projected to be key opportunities for the application of nanocrystalline cellulose in the biomedical sector. Manufacturers of nanocrystalline cellulose collaborate with forest product manufacturers in order to focus more on sustainability and to produce green-nanocrystalline cellulose.Manufacturers of nanocrystalline cellulose collaborate with forest product manufacturers in order to focus more on sustainability and to produce green-nanocrystalline cellulose. Economic barrier in the form of high capital cost is likely to hinder the market. Prices of nanocrystalline cellulose are higher than that of substitute products. This, is expected to shift the buyer’s preference from nanocrystalline cellulose to its substitutes. Capacity expansion of manufacturing plants require installation of advanced equipment, technology, and quality management systems. This is likely to refrain manufacturers from expanding to new geographies. Based on end-user, the global nanocrystalline cellulose market has been classified into composites manufacturing, paper processing, food & beverage, paints & coatings, medical & pharmaceutical, personal care, and others, which includes oil & gas, textiles, and cement. The paper processing segment dominated the global nanocrystalline cellulose market in 2017 owing to the rise in demand for nanomaterial coated paper and films which have applications in nano-electronics. Rise in demand for brighter, glossier, and high-quality paper among consumers is fuelling the paper processing segment. Nanocrystalline cellulose increase the tensile strength of paper, while reducing base material weight. In terms of consumption, North America dominated the global nanocrystalline cellulose market in 2017 due to the rise in government spending on nanocrystalline cellulose, increase in demand from paper processing and composites industries, and rise in focus on the production of sustainable products by manufacturers in the region. The Federal Government supports the production of nanocrystalline cellulose due as it helps reduce carbon footprint. Growth in forest wood-based economy in Canada and states such as Minnesota, Michigan, and Vermont in the U.S provides easy accessibility to raw materials, thereby boosting the demand for nanocrystalline cellulose. Countries in Europe are extensively researching on nanocrystalline cellulose. In terms of production and consumption, Sweden and Norway accounted for large share of the market in Europe in 2017. Rise in awareness regarding the usage of environment-friendly products in the developing countries of Asia Pacific is propelling the market in the region. The nanocrystalline cellulose market in Latin America is in the early stage of development. In terms of consumption, Middle East & Africa accounts for a small share of the global market due to lack of awareness regarding biomaterials and their applications.